We aim to further improve the designs of existing products & systems to increase performance and decrease energy consumption as well as innovate state-of-the-art technology. Boldrocchi dedicates a large percentage of its resources to research & development (R&D). Not only does the company invest funds towards innovation, but it has allotted a considerable amount of space in its Italian manufacturing facilities to R&D as well. Our air pollution control R&D team has worked with the University of Naples to develop a new wet electrostatic precipitator (ESP) that captures not only PM 10 and PM 2.5, but nanometric dust particles (1000 times smaller than PM 2.5). This puts Boldrocchi ahead of legislation, which is sure to regulate nanometric dust for industry in the coming years. 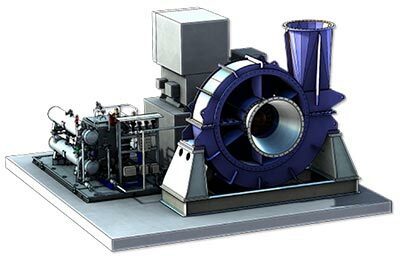 Experts in API 673 blowers for sulfur recovery, Boldrocchi wanted to extend its offering to include centrifugal compressors meeting API 617 & API 672 for higher pressure applications. These compressors are compact and low maintenance, offering lower operating costs and higher operating efficiencies than other solutions. After significant theoretical calculations and CFD modeling, we were able to set-up a 1:1 scale model to test the performance – according to international standards – of 12 m (40 ft) filter bags with both conical and cylindrical shapes. With the goal of offering customers higher performance and lower cost, we re-designed all components of selective catalytic reduction (SCR) systems (ammonia/urea evaporation system, ammonia injection grid and SCR reactor inlet hood and body) to offer higher-than-usual abatement levels while containing ammonia slip. Among the most impressive results: Boldrocchi engineered a SCR system working at a mere 160°C (320°F) with 60 mg/Nm3 in residual emissions – a successful emission reduction at probably one of the lowest temperatures in the world. Continuous research and development is the only way to remain successful.